Example of the pictorial work of Confucio Hernandez, showing remarkable detail in the movements of catfish as they pursue their prey. Abstract: This essay focuses on the supportive efforts of Tropenbos International Colombia to bring to light the vast knowledge and close relationship indigenous peoples in the Colombian Amazon have with their surroundings. It presents extensive evidence of the value of this knowledge as related to the aquatic world. The intention is to recognise traditional and local knowledge, to contribute to the cultural strengthening of indigenous peoples, and to form a platform for knowledge dialogue with science and academia in general. Specifically, the big catfish (bagres) is examined as a case study. Local fishermen have added new information about bagres to the scholarly corpus because of their year-round attention and observation of its habits and predatory behavior across a wide area. Traditional research methods of necessity have been far more limited in scope. The case study demonstrates the need to recognise the value of traditional and local knowledge and the need for a strong dialogue between local indigenous peoples, academia, and authorities in setting realistic and sustainable environmental and resource policies. Indigenous knowledge of the world of water and fish is vast, deep, complex, and integrated. When we talk about the Amazon, we emphasise the thousands of kilometres across the basin, the most extensive and continuous forests in the world, and the Amazon River as the largest on the planet. In general terms, we refer to the Amazon as tropical rain forest due to its extensive vegetation cover, but when the spotlight is put on water, the maps show an incredible network of creeks, streams, and rivers that resemble the human circulatory and nervous system, leading many to affirm that the Amazon forest is more water than forest, although in relational terms forest and water have always gone together. Indigenous knowledge of the world of water and fish is vast, deep, complex, and integrated. This essay seeks to highlight the close relationship that indigenous peoples have with the aquatic world, taking as an example the emblematic species of fish that can reach more than 2 metres long, which indigenous peoples know to perfection. It seeks to address academic research and science and its methods through a dialogue of knowledge about predator–prey relationships. The traditional knowledge of indigenous peoples and the local knowledge of communities are either neglected in scientific research or are included but considered anecdotal knowledge and therefore invalid; yet, their knowledge offers many elements for understanding nature, its processes, and its relationships. For more than two decades, Tropenbos International Colombia has been carrying out a process of widespread recognition of the traditional and local knowledge of indigenous peoples of the Colombian Amazon and has implemented mechanisms to support this knowledge through research grants for traditional knowledge-holders and indigenous communities in general. The intention is to recognise traditional and local knowledge, to contribute to the cultural strengthening of indigenous peoples, and to form a platform for knowledge dialogue with science and academia in general. We also hope that this knowledge will contribute to decision-making processes and policies for the conservation and good management of the forest and its resources. The traditional knowledge of indigenous peoples and the local knowledge of communities are either neglected in scientific research or are included but considered anecdotal knowledge and therefore invalid; yet, their knowledge offers many elements for understanding nature, its processes, and its relationships. The issue of water and fish has been addressed in various ways, from research in ichthyology and fish biology to proposals for local research into the world of water and fish. In the first instance, a good tradition exists of academic research by universities and research institutes of the National Environmental System (SINA), including the National University, Jorge Tadeo Lozano University, the University of Antioquia, the University of Tolima, the Amazon Institute for Scientific Research (SINCHI), and NGOs such as Omacha, the World Wildlife Federation, and Tropenbos. In the case of proposals by indigenous communities and fishermen, existing documents compile aspects of traditional knowledge such as the mythology of the origin of fish, classification systems, diseases caused by fish, and fish distribution or biogeography. Due to its economic importance for the region, a topic of particular interest is the big catfish (bagres)—the most stable source of income for local inhabitants who are largely engaged in fishing. Big catfish are the focus of a case study for addressing environmental governance, especially management of fish resources by public institutions, public policies, and existing legislation. Knowledge of the life cycles and ecological relationships of big catfish, especially the predator–prey relationship, is essential for defining resource use and management. Scientific research has addressed some aspects of reproduction, migration dynamics, and studies of stomach contents through which prey consumed by big catfish are defined. Similarly, fish biology deals with determining parameters such as catch and the fundamental efforts required to observe and monitor the status of the resource, extracting it from the natural environment. These academic approaches favour quantitative methods and researchers making records over short periods of time, or even on an annual basis, but almost never cover multiyear periods, which would be expensive and would require the continued presence of biologists in the field. The development of participatory research methodologies with local fishermen has helped define with precision the extent of overfishing of large catfish over the past four decades, with information coming directly from both fishermen and fish traders. Community monitoring of resource use provides valuable information, but we tend to incline toward biological and quantitative information-generating data and valuable statistics despite the limitations of these methods for understanding the complexity of the ecology of large catfish and their continued operation. For this reason, we have developed mechanisms for direct support to local people as a way of recognising their knowledge, and for building knowledge dialogue platforms. Results from original materials, drafts, oral testimonies, discussions, and presentations are presented in this document, in order to demonstratethe value of communicating with local knowledge in a variety of ways. To address and understand the complexity of the exploitation of large catfish, we supported and followed a local research project based on the accumulated experience of many fishermen through their precise observations and memories, and we collected relevant information about the ecology of these fish species. First, we supported the fishermen and their assistants taking daily information by making registers for them in simple formats, similar to those for business accounting records. In addition, we supported local research for the reconstruction of the stomach contents of seven large catfish (dorado, lechero, pejenegro, pintadillo rayado, pintadillo tigre, and pejeleño, and Pimelodidae family) from the records of an experienced fisherman. Work on the big catfish and their prey was carried out by Luis Angel Trujillo, a non-indigenous local fisherman with 40 years of experience who was very close to the indigenous world, having always lived in the forest and been married to a Yucuna indigenous woman. His work was based on his knowledge of fish in general and large catfish in particular. His local research proposal was to document the prey of each of the big catfish. First, a format was defined that included species consumed by each large catfish, followed by columns to record the times of year when these species were consumed, according to the hydrological cycle and specific niches where they were captured (Figure 1). Figure 1. Data matrix designed together with the fisherman, Luis Angel Trujillo, to organise information on predator–prey relationships of big catfish. Columns were included on hydrological periods of the Caqueta River and catchment areas. A column also indicates whether the prey was bait or consumed naturally. From this information, it was learned that big catfish also eat prey that are present only on hooks but not in the wild. Figure. 2. Initial illustration of predator–prey relationships, with illustrations of prey in order of consumption preferences for large catfish. This registration exercise of prey for each of the big catfish led to an excellent documentation of predator–prey relationships, which are known through technical papers and scientific research, such as important studies by Goulding and Barthem (1997). 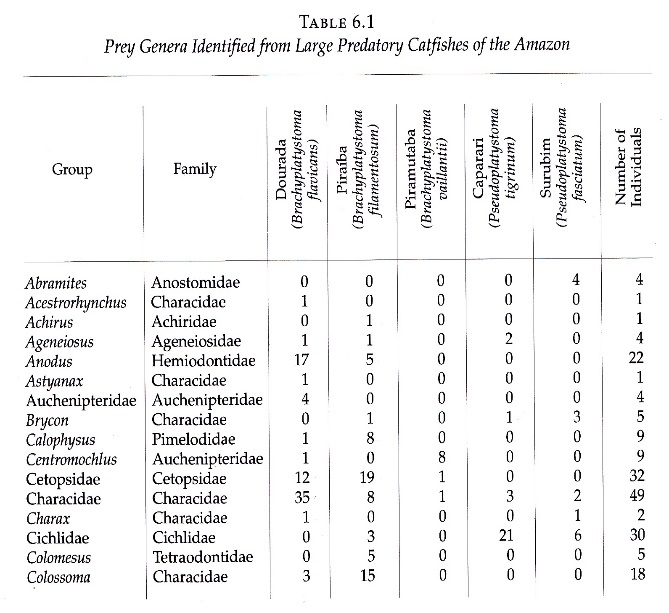 These renowned researchers generated a table that relates big catfish with their prey for a total of 54 species, following the analysis of stomach contents during several years of study. 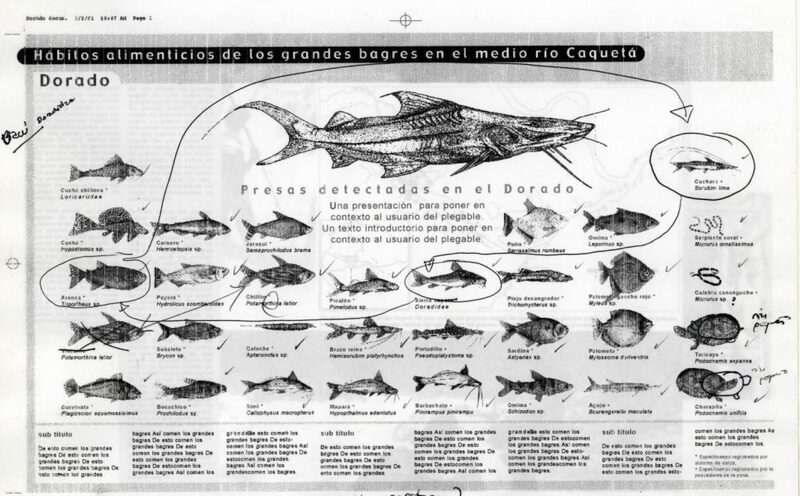 In the final figures, the dorado catfish showed a consumption of 39 species, followed by the lechero with 38, the pintadillo tigre with 25, pintadillo rayado with 17, and the pirabulón with 7 species. Figure. 3. 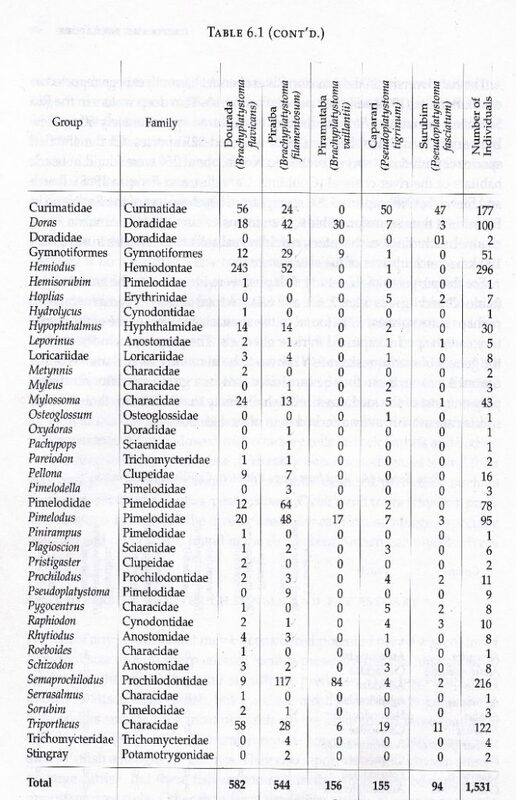 Table of comparative consumption of prey species, according to the study of Barthem and Goulding (1997) and the monitoring of local fisherman Luis Angel Trujillo. According to the records of the local fisherman, these figures rose broadly, even quadrupling the number of species that big catfish prey on. The results are cause for an important debate in science, given that local knowledge expands upon and contributes valuable information that fish biology methods cannot provide because these methods are limited to short periods of observation time or analysis in just one place or area. Similarly, from local know-how, three species were included that do not appear in the Barthem and Goulding study—the pejenegro, guacamayo, and baboso—each with high numbers of prey consumed (Figure 3). 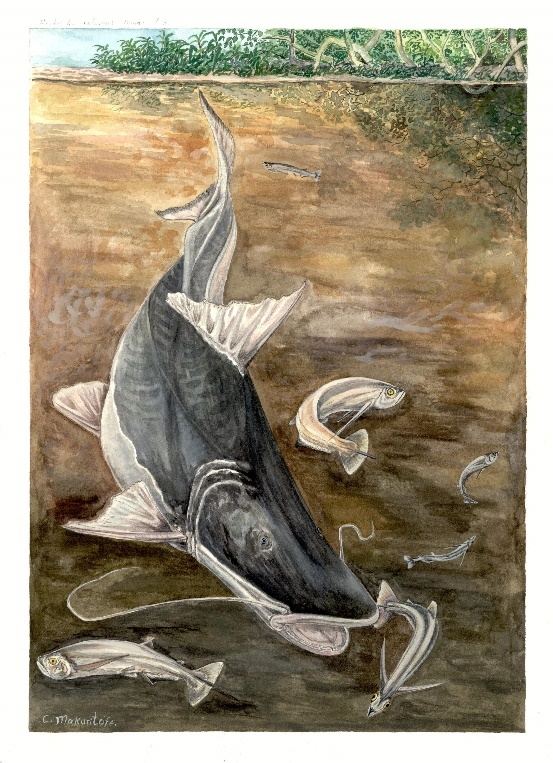 This detailed information is the result of a permanent observation of what happens in the river and a constant review of the stomachs of catfish, where one can find anything, from whole fish to stinking residues of badly decomposed remains—still recognisable to the trained eye of local fishermen—which enable the visual design of ecological predator–prey relationships in all their complexity, as expressed in figure 4. Figure. 4. 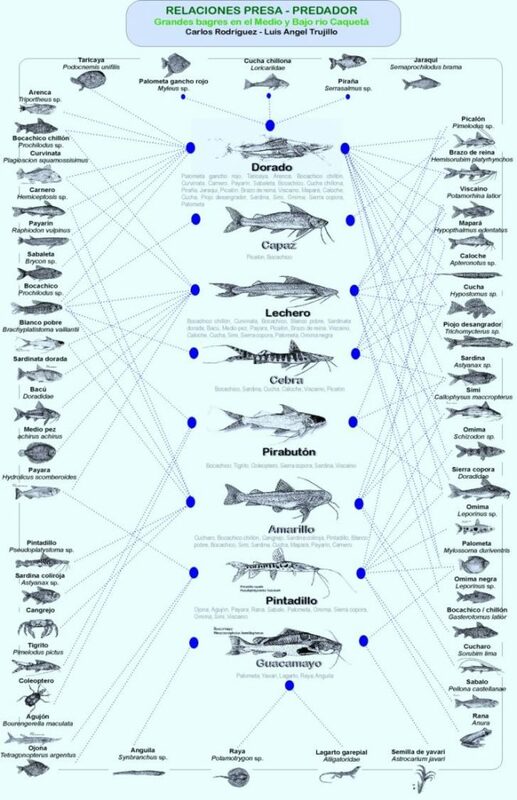 Infographic of an integrated vision of predator–prey relationships of big catfish based on exclusive and shared prey of eight large catfish in the Caqueta River. This local research work, despite generating new and very interesting information, did not communicate much about ecology and ethology, as it did not delve into the reasons for the predator–prey relationships nor explain the food preferences, the supply of prey, or the ways that large catfish pursue and capture prey species. Thus, Luis Angel Trujillo’s work continued in order to document in greater detail his knowledge of predator–prey relationships in big catfish, and this work resulted in a wonderful document, written in an engaging style, that humanises each species of the big catfish, narrates their food preferences, and details how they pursue and capture each of the species on which they feed. This type of documentation is fabulous because it records in writing extensive oral testimony, narrated as if being told in public, at a family gathering, or with friends. The following extracts are from two texts by Luis Angel Trujillo: his description of the lechero, the largest catfish in the Amazon, and the omima, one of its favourite prey. The lechero is the largest of all the big catfish. According some cases reported in the study area, females can weigh up to 160 kg and have a size of up to 1.80 m; males weigh up to 35 kg and measure up to 1m in length, the skin colour being lighter or darker depending on the colour of the water where they are. The belly and sides to the half-way line are white, with the back, the tail and the head the grey colour of dark lead. Their behaviour is migratory, settling at times of rising waters and high waters along the Caquetá, Cahuinarí, Mirití, Yari and Bernardo Rivers, up the Apaporis River to the falls of La Libertad. While they are juvenile almost adult, it is possible to find them at times of high waters in the wide creeks like the Meta, Quinché, Sol, Tigre, and Irá (the creek of Atiba Miraña), in the high waters of May, June and July, and the midwaters, August and September, where they can easily prey on juveniles of other catfish and scale fish species. They travel fast, unlike the dorado, and in times of low water, if they find a quiet space with good depth they can even stay until the return of high waters; in these creeks they can easily travel 20 to 30 km upriver. Their meat is sought after in the diet of the local population, although capture is mostly for trade. In the area of ​​this study there was no record of their presence in flooded areas in times of high water, though in the flooded areas adjacent to the banks of the Caquetá River, male specimens have been caught using the colgadero method. Although the thrown net is used for capture, the most common method of capture is performed with rope, guaral and spinel, and it is important to note that for every 100 catches with methods where hooks are used, 95 are female, already at reproductive age; whereas with nets it is on the contrary, for every 10 catches 7 or 8 are male adults or juveniles. The lechero are excellent carrions. Their only predator at juvenile or adult age are bujeos, the pink dolphin, who hunt them in shallow waters of the beaches; they start nipping and removing the fins and tail, and then rip off pieces of meat from their back, and if they cannot reach the belly and have not severely damaged the chest and the head, the lechero holds on for around four hours while bleeding, then goes head down, lifting the stump above the water so as not to be bitten by sardines and canyiruces, and is carried away by the current, until finally it sinks entirely and bleeds to death. In times of rising waters the lechero preys on shoals of scale and non-scale fish that are migrating. The attack is fast and sure, unfolding its great strength. In times of low waters, the (summer) months of January, February and March, it preys in the shallows of the beaches, on hatchlings of charapa and taricya turtles, also scale and non-scale fish marauding in these sectors. Along the riverbank and backwaters of the beaches, it hunts young arawanas. It is very active and aggressive in times of high and low waters. It can be observed in shallow water, a meter and a half deep, in an attitude of resting, either alone or in a group of four to six individuals; or in running water, always at the top of small jets, rocky and pebble beaches, in the Caquetá River. Also in times of low waters, it likes to swim at the surface along the main riverbed, alone or in groups of six to eight individuals. It is present throughout the river’s body of water, in deep, intermediate and surface waters. (Luis Angel Trujillo). This precise description includes anatomical features, sizes, weights, and colours, which are easy to describe; it also delves into issues of behaviour that can hardly be observed by untrained biologists, and within an area covering ​​hundreds of kilometres, thanks to the constant journeys made by fishermen along the river. The following account of the omima provides even greater precision regarding aspects of biogeographic distribution, anatomical features, ecological relationships, food, habitat, and reproduction; it gives very detailed observations on ethology and life cycle. I am the lechero—they also call me piraiba or bully—and together with the pirarucú, we are the biggest fish in the rivers and creeks, and we are also the ones who eat all the fish in the river, creeks and streams. Here I’m going to tell you about all the fish that I like, where they live and what they eat. The omima gavilán is not an omima of the creek. Sometimes you see them in the river mouths of the creeks, but they really live along the banks of the great rivers like the Caquetá and lower part of Cahuinarí, Yari, Apaporis, Bernardo, Mirití, Quebradón el Quinché, Metá, Sol, Irá (of the Atiba Miraña), or El Tigre in winter time, May, June and July. However, they do enter the flooded areas of the rivers and creeks, where they eat wild fruits as chontadurillo, yavari, canangucho, siringa seeds, cargeuro of the riverbank, guamo de sapo seeds (Inga sp), guamo de charapa seeds (Inga sp), which are on the banks of the river; laurel seeds of the river bank, which are dropped by the monkeys and parrots, faeces from the iguanas who eat the buds (cogollos) of the guamo de sapo—they always eat the leftovers because their teeth are smaller than those of the other omimas, and that is why they do not break the hard seeds. They eat by nipping at everything, so they also eat a lot of buds and algae, which are soft for them: buds from guama de sapo, yarumo, guayabillo, the green algae of green, dry sticks that are sunk in the water, and the larvae of dragonflies that are stuck to the dry sticks and covered by the water—this is winter time when the river is high, in May, June, July and August. The omima gavilán likes to be in the depths, and only surfaces to eat buds and algae, staying always at deeper levels, at around three armlengths of depth when the river is starting to grow and the rays are stirring and eating worms, they move closer to eat leftovers, when the river begins to dry, which is August, September and October, and they return again to the riverbank in November and December, when the river is again midwater, they follow along the bank, and there they eat mostly algae from the tree trunks. This is the only omima that likes buds and green algae, so in summer they do not go hungry like other scale fish, because when they do not find leftovers to eat they eat algae from rocky ground and enclosures formed by the banks. In summer, January, February, March and a bit of April, the omima gavilán lives in riverbank enclosures, rocky grounds, and are the only omima living in backwaters of the beaches. Another thing that helps the omima gavilán is that their head is narrow and flattened, similar to the bocachico and not like other omimas; the gills have very fine hairs, and when water passes the bugs and larvae from the water are left there, and the omima swallows them and they provide food, which is why they have long tripes and a long belly also. The taste of omima gavilán meat is different and sweet, so it is not good for broth, only for tucupí or muquiada. The lechero hunts them, in the backwaters of the beaches, in the small currents below the beaches by day, because at night they sleep hidden in the enclosures of the backwaters and riverbanks, they also sleep in holes in the riverbank that are abandoned homes—from corronchas, who like to make holes in the banks to lay eggs and live there. The omima gavilán do not live in large shoals but in groups of six or eight, four or six adults and two or three juveniles. The hatchlings live solitary lives, mixed in with sardines along the banks of rivers and the mouths of creeks. In lakes that are very close to the shores of the great rivers and creeks, one can also find them, but juvenile almost offspring, and when they reach a creek where there is a house near the entrance, they settle below the house. There they eat the leftovers that are thrown out from the kitchen and nip through banana and cassava peelings; and when you do make cebadero with chontaduro peelings in summer in the rocky beaches and along the banks of the creeks, they also arrive. The omima gavilán has silvery scales throughout the body; on the back the scales become darker, like a dark grey, spread around the body like a belt, with ribbons of very dark, black color that are highlighted by the silver scales—in groups of four, four clearly marked towards the centre of the body and one that looks like a small blotch, very close to the brow of the tail, and measures one quarter and ‘jeme’ when it is old, the same size in females and males. The only change in males is that they are wider than the female, and the male is small compared to the body size of other omimas, the mouth is also smaller, so to catch them you need a small hook. The juveniles, almost adults, measure one quarter (25 cm) and hatchlings measure one ‘jeme’ (15 cm); the pectoral fins, tail, spine and belly are light grey, the head is a greenish grey—the same colours from when they are very small. The omima gavilán lays eggs in the shallows of the beach and along the banks of the river, in the month of February towards the end, when the river is just starting to grow; but it does not do this in the same way as other fish, which depart in a large shoal and everyone knows that they are laying eggs, but in the shallows that are flooded, one can see them moving, in quick circles, not swimming in a straight path; they also lay eggs in the early evening, where the water is not yet dirty nor fast flowing, and that is when the sardines can eat the eggs that are not yet covered with the dirt that the omima stirs up when they are laying. When the eggs burst, the small omima mix in with the small sardines, and climb a little up the banks, then they go mixing in and staying along the banks of rivers. This omima is good bait for the lechero because it smells like the beach, but it does not last long because the canyirú fish (family Cetopsidae) eats it very fast, not even leaving the bone. It is used, but as a bait in the evening when the canyiruces settle and stop looking for food, because canyiruces will scavenge desperately early on, and later they quieten down when you are fishing for lechero, with a line or espinel. The bait is put at six in the afternoon and again at eight the evening, and is checked again at 11 in the evening, and stays with that bait until dawn, to be checked at five in the morning. The checks are also to take out any lechero that has been caught early, because if it tires and dies then the canyiruces will eat it. Clearly, testimony in this engaging style provides good-quality information and great reader satisfaction. 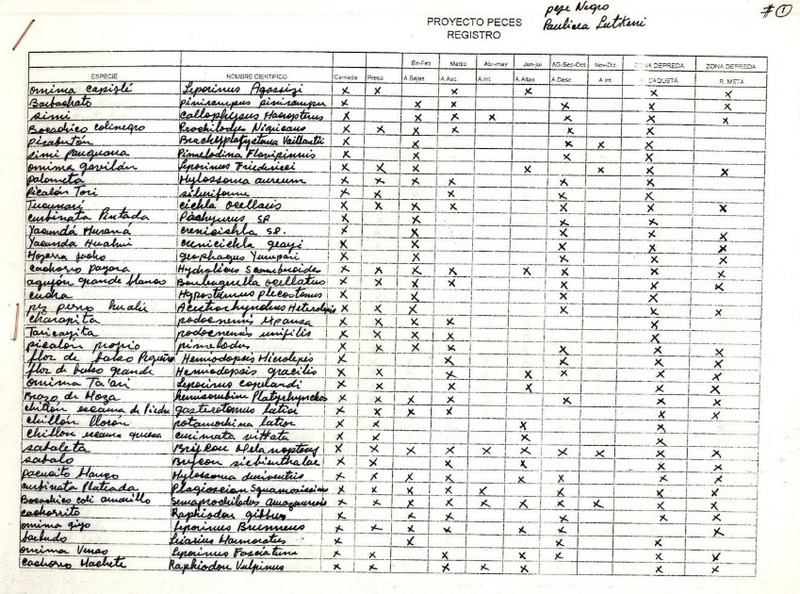 The documents produced by Luis Angel Trujillo took into account and included many qualitative aspects, which went far beyond simple registers, but because of the complexity of aquatic ecosystems and ecological interactions, it was necessary to illustrate these relationships in order to understand them better. 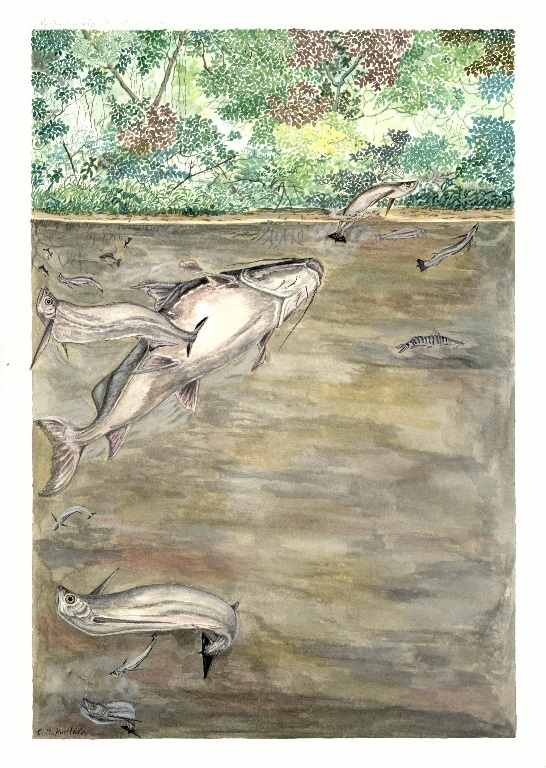 Although Trujillo has talent for drawing, he did not dare do the artwork himself, so we called on a young Uitoto indigenous man, Confucio Hernandez, who had been drawing water ecosystems, to illustrate the predator–prey relationships in large catfish—resulting in wonderful and impressive illustrations that show the power of images to communicate. 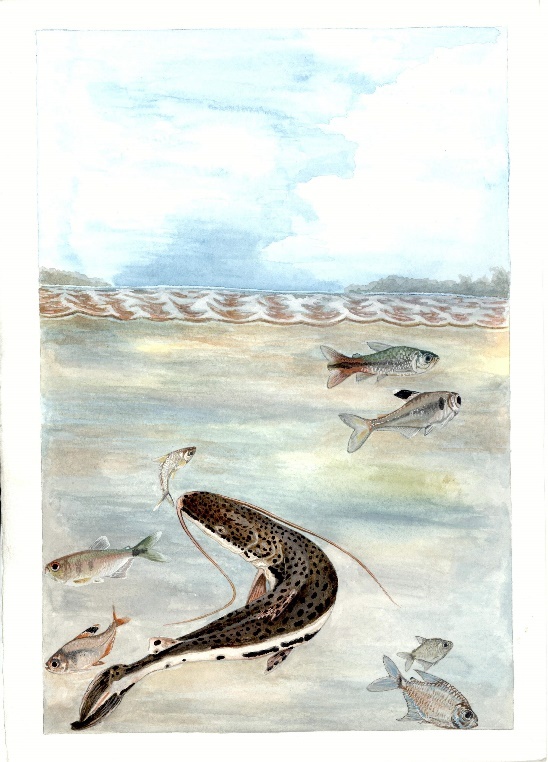 The young artist has already produced more than 50 illustrations showing the relationship between catfish and their prey, specific capture areas, and the hydrological cycle throughout the year. It was an incredible challenge to capture the dark world of the river and its transformations, from shallow waters to deep waters, through rising and falling water levels, and the colours of darkness, because although the Caquetá River has clear water, the river is highly turbulent and one cannot see more than 30 to 40 cm from the surface. The pictorial work of Confucio Hernandez shows the close relationship of indigenous peoples to the world of water—he masters the colours of water, the colours of the catfish, the colours of the species of small fish that are their prey, the banks, riverbeds, beaches, enclosures, and vegetation on the riverbanks—in a great lesson about aquatic ecosystems of the Colombian Amazon. Remarkable detail also shows the big catfish in pursuit of its prey, the precise movements, and how it attacks individual fish or shoals of fish. Generally speaking, these are masterpieces of local knowledge of the world of water. The illustrations as a whole generate a dialogue of knowledge with academic research and in themselves are an example of the complexity of Amazon ecology, a complexity that is looked at species by species and that teaches us that complexity should be addressed in a holistic way, as should traditional knowledge, in considering knowledge for life and good living (buen vivir). Figure 5: Examples of the pictorial work of Confucio Hernandez, showing remarkable detail in the movements of catfish as they pursue their prey. An institutional and legal framework has been established in Colombia for the management of fishing—the National Authority for Fishing and Aquaculture (AUNAP)—an entity that was created just a few years ago and is the legacy of multiple institutions charged with fisheries management, such as the INPA, ICA, Corpoica, and Incoder. These agencies relied heavily on the agricultural sector and the Ministry of Agriculture. They have also operated in the past with low budgets and a limited presence in the Amazon but have generated the guidelines and regulations for the control of fishing, especially of big catfish—an activity that is the most stable source of income in the Caquetá River, where the research discussed here has taken place. Fishing regulations govern the means of capture, the establishment of fishing seasons, and minimum landing sizes—rules that in practice are not complied with. This non-compliance has been caused, first, by rules that were not the result of participatory processes for managing fishing, and second, because of an absence of any direct presence by environmental authorities, fishermen and traders conduct their activities unchecked. In addition, questions have arisen over whether these rules have been based on comprehensive knowledge of the catfish, whether they have been the result of social processes of participation, whether local knowledge has been included, and whether there is broad support from local people. Fishing management has made great strides in recent years and now recognises the role of local communities; regulators even work together with fishermen to define management guidelines. However, local knowledge and the role that communities can play offers a new challenge of empowering social actors with their knowledge and capacity for decision-making over the proper use of resources, and also simply remembering that an environmental authority should have extensive knowledge of the resource they are regulating as well as a permanent presence—in this case the local fishermen. The knowledge and skills of local fishermen should be part of a new governance based on the recognition of their local knowledge in dialogue with academia, the natural sciences, the social sciences, political science, and the humanities. In this way, authorities and indigenous peoples can work together on decision-making that leads to real and sustainable uses of fisheries resources. Barthem, R., and M. Goulding. 1997. The Catfish Connection: Ecology, Migration, and Conservation of Amazon Predators. Columbia University Press, New York. This text and the accompanying images include reproductions of traditional knowledge. Duke University recognizes and respects traditional knowledge, intellectual property, and cultural heritage shared by indigenous communities and asks readers to do the same. The University does not possess the authority to grant permission to re-post or re-publish this paper; it is our understanding that researchers may quote from it or cite it by adhering to accepted standards regarding copyrighted content. This paper was prepared by Carlos Rodriguez and Maria Clara van der Hammen of Tropenbos International in collaboration with Luis Angel Trujillo and Confucio Hernandez for a symposium at Duke University in March 2016 (Narrating Nature).